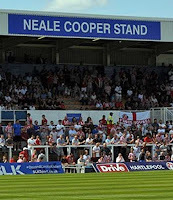 Neale's family attended as the MILL HOUSE STAND was renamed the NEALE COOPER STAND. Three and a half thousand fans turned out but two thousand of those were Mackems hoping to see a rise in fortunes for their ailing club. Like Pools they now know what lack of investment is all about and having lost to Darlington earlier this week they hoped for a turnaround. Sadly for them Pools played them off the park. What looked like Bates' strongest side were really compact and chased down every ball. Nico lobbed their keeper for a well-deserved goal that lasted till the ref blew his whistle once they had got the equaliser. It seemed like an eternity once the Vic clock stopped on ninety minutes till the official finally blew the whistle, letting them equalise with virtually the last kick. 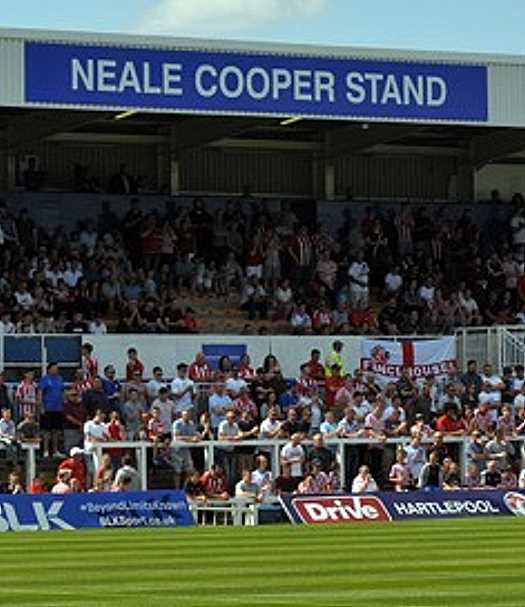 "I'm still getting used to the new faces - and the haircuts of some of the old ones"
OK, Sunderland have been probably the best of the local clubs to support Pools and again today two thousand Mackems came, which made it a great day for our tribute to Neale Cooper. Flowers were laid in front of the stand and there was a minute's applause for the late best manager we have had in recent times. On the hour Bates brought everyone off apart from Kitchen, the left back, which made us think have we only got one no 3(??) I'm still getting used to the new faces - and the haircuts of some of the old ones - but it was a good performance by the lads and at this level we look a decent squad.